Bring homespun appeal to decor with a ruffled burlap table runner. Burlap is a favorite of crafters for its "farmhouse" style and shabby chic roots. 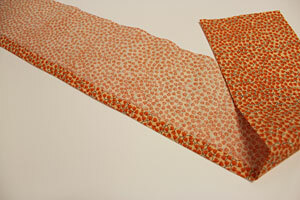 And this sturdy fabric is a great surface for embroidery! In addition to the cozy look of burlap, ruffled trim adds a finished look for a table runner that is rustic and elegant at the same time. 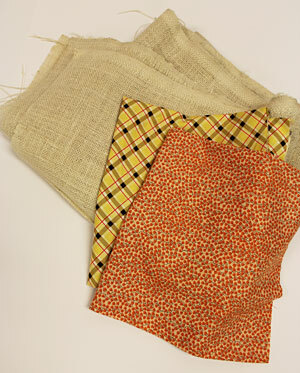 Read on for step-by-step instructions to create your own burlap table runner! I used the small sizes of the Leaf Cameo - Oak, Leaf Cameo - Elm, and Leaf Cameo - Cottonwood. 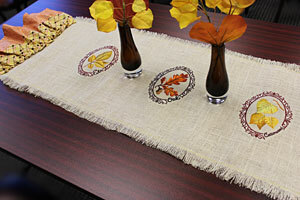 Embellish your table runner with any themes and motifs you like. 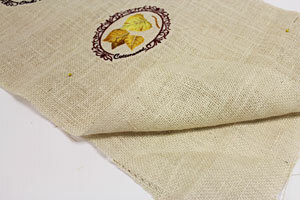 Solid, stitch-filled designs work best on sturdy burlap. Avoid lighter designs (such as Redwork and vintage-stitch designs) as these delicate stitches may "disappear" into the burlap weave. 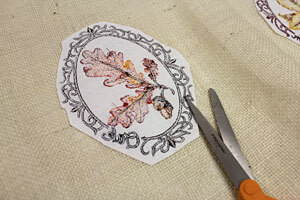 For additional tips about embroidering burlap, see this Fabrics 101 article. 57" long by 16" wide. You can make the table runner any size you like. The first step is to decide how long and wide you want your table runner to be. Remember, the ruffle ends add a total of 15" to the length. I want my table runner to be about 57 1/2" long by 16" wide, so I cut a piece of the burlap to 42" long by 16" wide. I prepared paper templates of the designs by printing them at full size with embroidery software. If you haven't used templates for design placement before, click here for a quick tutorial. I arranged the templates on the fabric how I wanted them, leaving at least 1 1/2" between the top and bottom edges of the designs and the top and bottom edges of the fabric. I also measured equal distances between the outer side edges of the designs. Then I poked holes in the center of the templates with an air-erase pen, marked the fabric there, and marked the horizontal and vertical axis points. Next I removed the templates and drew lines connecting the marks, to line up the fabric in the hoop in the next step. I sprayed a piece of medium weight cutaway stabilizer with temporary adhesive and smoothed the fabric on top. Then I added a piece of water soluble stabilizer on top of the burlap. This topping helps keep the edges of the embroidery crisp and clean. I hooped all three layers together by aligning the marks on the hoop with the lines on the fabric. Then I attached the hoop to my machine, loaded the first design, and embroidered the design. 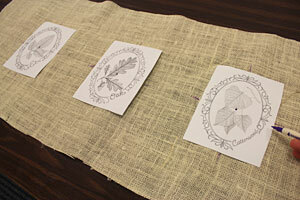 For more about embroidering on burlap, click here for a Fabrics 101 article. After the design had finished, I trimmed away the excess stabilizer from the backside of the embroidery. I tore away the water stabilizer topping, removing any remaining bits with a tweezers. You can also wet your fingers and brush any remaining stabilizer away. Then I repeated the steps above to embroider the rest of the designs. Next I prepared the ruffle trim for the short ends of the runner. 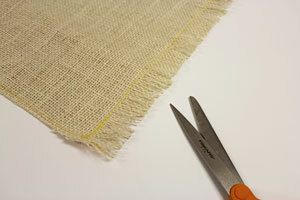 To prepare the top half of the trim, I cut a piece of print cotton fabric using the width of the burlap section by 6" high. I turned the top long edge of the fabric in 1/2" to the wrong side and pressed with an iron. Then I turned the folded edge over another 1/2" to the wrong side and pressed, and finished the edge by sewing a 1/4" seam along the folded edge. 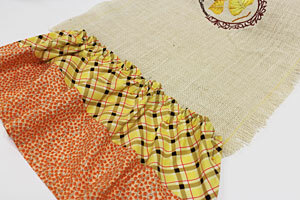 For the bottom half of the trim I cut a piece of print cotton fabric using the width of the burlap by 5" high. I turned the bottom long edge of the fabric in 1/4" to the wrong side and pressed, then zigzag stitched along the raw edge of the fold. Then I aligned the long raw edges of the top and bottom halves, right sides together, pinned in place, and sewed a 1/4" seam along the pinned edge only. I pressed the back seam open and turned the short side edges in 1/4" to the wrong side once again and pressed. 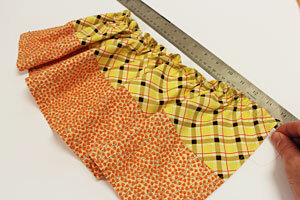 Then I sewed a 1/8" seam along each folded short end. I repeated this process for a total of two trim pieces (one for each short end of the runner). To create the ruffle effect, sew a 1/4" seam along the entire top edge of the trim (along the existing seam -- sew back and forth at the start, but sew straight off the opposite edge at the end). Next, sew another seam 1/4" under the first seam all along the top edge of the trim (secure the start and leave the opposite end open as you did with the first seam). Separate the threads at the open ends. 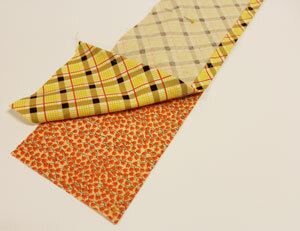 Hold the bobbin threads from each seam in one hand and bunch the fabric together along the seams with your other hand. Move the fabric down the seams, ruffling as you go. Ruffle the fabric until it is the same width as the burlap section minus 2" to allow for the fringed edges that will be added later (mine is 16" wide minus 2" equals 14" wide). Tie off the bobbin threads and trim them. 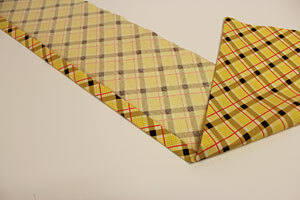 Do this on both trim fabric pieces. To add the back fabric to the embroidered burlap section, I laid the embroidered top piece on top of the burlap, wrong sides together, pinned in place, and cut around the shape. Then I sewed a 1/2" seam along each short end and a 1" seam along each long edge (the seam allowance along the long edges will be fringed). 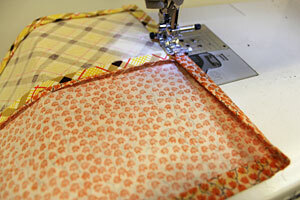 I sewed each seam twice to strengthen them and keep the fabric from fraying. Then I fringed the seam allowance along each long edge by removing the long threads and trimming the remaining threads so they are even. To add the ruffled trim pieces, pin them at each end with about 1" of the top edge of the trim extending onto the burlap section. 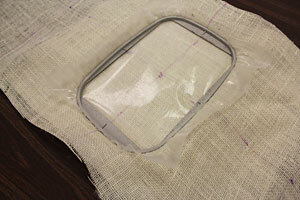 Then sew a 1/4" seam across the top edge of the trim to tack it in place. And your table runner is ready to go! 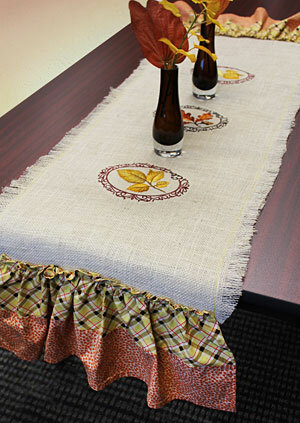 Add a touch of country-style texture to any table with a ruffle burlap table runner! 6.90" x 8.93" | 5.86" x 7.58" | 4.86" x 6.28"
6.91" x 8.94" | 5.90" x 7.63" | 4.88" x 6.31"